In recent years to number of wine auctions, wine festivals, wine weekends, barrel tastings, etc. has escalated past the point of sustainability. Or so it seems to me. While I understand the appeal of these events, I also have stopped going to most of them. Quite honestly, they are either too big, too expensive, or too noisy to be much fun. But there are exceptions, and this past weekend, I had the genuine pleasure of attending the Portland Indie Wine & Food Festival for the first time. In almost every way, this modest event, designed to support craft winemaking, outperforms the many larger, more ambitious and far more expensive auctions and mass tastings. It has to do with scale. The Indie Fest mirrors the city it is held in. Portland is a dream city for food and wine aficionados. It is a pedestrian-friendly town, with excellent public transportation. It is a town that loves all things green and eco-friendly. A town that seems to have more bartending, winemaking, distilling and food making talent than any in the country. And it is a friendly place, where the barista at a mobbed Stumptown Coffee still has time to smile and share a joke, where the waitpersons are attentive without being intrusive, where there are entire city blocks ringed with food trucks and wagons, from virtually every corner of the world. The weekend brought many pleasures. The Hotel Deluxe, located just across the freeway from the Pearl District, has been renovated and themed with a classic Hollywood look. Every floor is dedicated to a specific film director, with large black and white stills from lining the halls. The restaurant options are endless. My dinners at The Country Cat and Bar Avignon featured interesting, hearty, non-fussy entrées and apps, excellent wine options, and pleasantly crowded rooms that had just the right mix of convivial conversation and relaxed servers. There was time to visit Olympic Provisions, the first USDA-certified charcuterie in Oregon. But best of all, the main event, a wine and food showcase on Saturday afternoon, had just enough of both to allow for a leisurely exploration over a four hour period. Other than rather daunting lines for the co-ed bathrooms (need more of those!) the venue (the Bison Building) and layout seemed ideal. There were 17 food tables scattered among some 51 winery stations. The wineries, all producing fewer than 2000 cases annually, were each pouring up to five wines. Prices were posted and most wines could be ordered. The winemakers took time – and had time – to chat without stress. There were people at every station, but no huge lines or backups. No one ran out of wine. There was a sense that every wine and winery was worth exploring. I focused initially on Pinot Gris and Pinot Blanc, as I am participating in a Pinot Gris seminar in a month, sponsored by Oak Knoll. It was very helpful to taste through more than a dozen different wines and chat with the winemakers about their widely varying styles. Later I went through and tapped into the Pinot Noirs. Wines from 2007, 2008 and 2009 were being poured. The style overall was exactly as I had hoped – restrained (not muted! ); elegant (not wimpy! ); aromatic and seductive. Alcohol levels are coming down, and the silly obsession with color that affected many of the early Oregon Pinot pioneers seems to have gone away as a new generation takes over. The late David Lett would have been thrilled with many of these wines. If I had to pick my top Pinot Noir discoveries – all producers previously unknown to me – they would be Helioterra, Matello, Utopia and Vidon. In a room loaded with excellent wines, these four really grabbed me by the throat. I didn't spit. My thanks to Festival co-founders Catherine Healy and Lisa Donoughe, to Watershed Communications and Travel Portland (my hosts for the weekend), and to everyone who made it such a special occasion. I look forward to returning in 2012.
glad to know our town did you right, Paul -- and happy to hear you enjoyed the DeLuxe; I wrote the "stories" etched in glass on each floor by the elevators RE the film genres/directors, my PW (pre-wine) profession. have you ever been out to Hotel Murano in Tacoma? another themed (glass) hotel by same developers, each floor themed after a world-renowned glass blower. rather beautiful. IWF brings up a question I wonder about from a critic's (and enthusiast) perspective, which stems from the practice of using another state's grapes to make a wine. what's your take on that? disclaimer: i have to admit, i oftentimes am as zealous as a religious convert in my ideas about using only grapes one grows oneself to make a wine. but i do appreciate other opinions. thoughts? Stephanie - I have not been to the Murano, though I did note that it's part of the same group. As for your question, remember that WA and OR share three different AVAs. So sharing grapes is perfectly natural. Many WA winemakers drive long distances to source grapes; there is no reason that some OR winemakers shouldn't do the same. The fact that each state has its own specialties also makes it more compelling to try out grapes from each other's regions. I don't have a problem with that. However, when out of state companies simply buy juice and bottle it, I get more critical. They are neither wineries nor growers; just businesses. Hi Paul, I feel exactly the same. 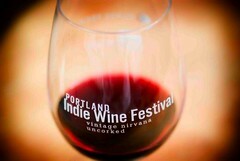 I'd love to go to the Portland Indie Wine & Food festival sometime but I just haven't had the chance yet. Although this is a couple of years old at this stage, it certainly seemed like you had a blast of a time. Are there any particular events that you can recommend in the Chicago area that are of similar nature? Tim, fun to revisit this post from almost four years ago. I can't help you with Chicago I'm afraid. You'll have to turn to local bloggers or media for that.